Some top spots to take your date on February 14 this year. 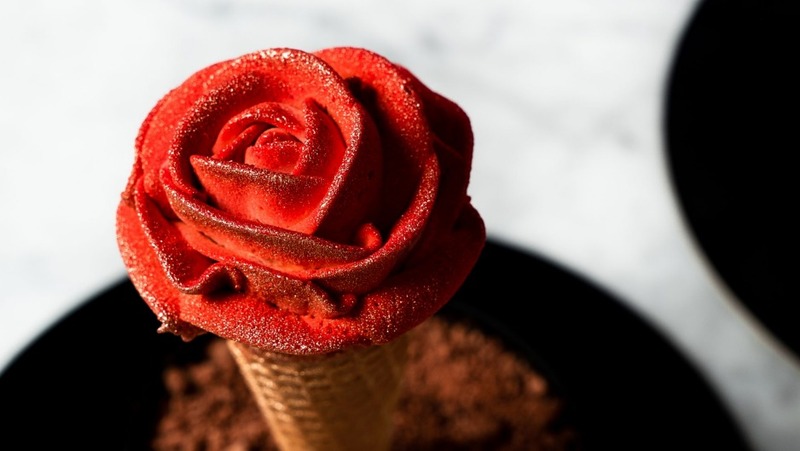 Go straight to your valentine's heart – and stomach – with a gelato rose this year. The $40 white-choc lined waffle cone is filled with dulce de leche and earl grey gelato, and topped with strawberry compote and salted caramel chantilly "petals" in a base of choc-hazelnut praline mousse and chocolate brownie. Order online, then pick up from selected Messina stores across the country on February 13 or 14. Put the Roman in romance with a romantic meal at Rushcutters Bay osteria Marta. Your three-course Italian feast includes a glass of prosecco ($90 per person). Chocolate lovers, this one's for you. Radisson Blu Plaza Hotel Sydney is launching a chocolate high tea in February to coincide with the arrival of the Charlie and the Chocolate Factory musical. Expect Willy Wonka-esque creations such as popping candy tarts, Oreo macarons, and choc chip scones with cacao cream – or on the savoury side, spinach and feta rolls and sausage rolls. You can even make it a family affair and bring the kids along ($49 per person or $125 for two adults and two kids under 10). In the mood for a romantic country getaway? Head to Moss Vale's Birch restaurant in the Southern Highlands for chef Ben Bamford's four-course shared menu ($75 per person), including a chocolate tasting plate and optional matched wines. If a New Orleans feast is more your speed, try a Louisiana-inspired three-course dinner ($79 per person) overlooking the harbour, including barbecued clams and mussels, roasted lamb rump with smoked cauliflower puree and Cajun-spiced pomme dauphine – plus a soft pretzel to finish. Champagne Taittinger Cuvee Prestige will also be available for $15 per glass. Head down to Woolloomooloo for a romantic two- or three-course pub meal ($89-99 per person), including fresh oysters and a glass of Veuve Clicquot.